Designed for maximum leverage and maneuverability. Available with pneumatic or puncture-proof tires. These versatile trucks handle loads up to 600 lbs. in either vertical or horizontal position. Ergonomic, flow back design reduces operator stress and improves handling ability. Trucks stand 46" high in the horizontal position, and adjust to a full 61"vertically. 8"x 14" toe plate and 12" x 36" platform keep loads where you need them. Blended poly casters and your choice of 10"pneumatic or Ace-TufÂ® puncture-proof tires. Wheel guards included. FOB Shipping Point. Product No. Wt. (lbs.) Description Price Ea. 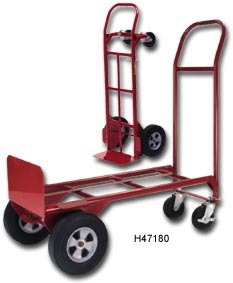 H47180 42	 Convertible Handtruck; Ace-TufÂ® tires. H49180 38	 Convertible Handtruck; pneumatic tires.